Love the camel coat! Interesting pants too! Loving the phone and pole yellows. Good photo, crazy outfit. beautiful coat- to make any look more beautiful. love the yellow phone case! I’m not a fan of pajama pants on the street, especially for men, but I do love his classic double breasted camel coat. So cool. Did he pick the phone to go with the lamp post, or vice versa? This coat is my obsession ! What a great camel coat. The trousers are a fun twist but I really like the coat. I want it for myself! 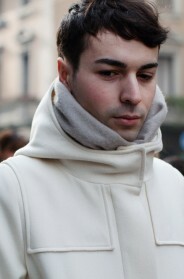 Italy is wonderful for men who look like style is as mannish as motorbikes. It is a good thing and this chap is a great example. love the pants ,the shoes and the photo!! Don’t you love those pyjama pants? I love those patterns and the color! Totally in love with printed pants this Spring – Lovely shot! The phone case, the camel coat – brownie points. 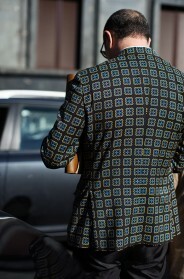 The man bag – seems like it’s the must-have accessory for men in Milan. Another phone in his right hand. The pants are a whimsical surprise -makes you think immediately that he is not as traditional and conservative as he might first appear! Fun! I love a man in a camel coat! Two NEON colored iphones?! I don’t know about those pants. They look a little like PJs, but admire his confidence in wearing them. I love the pose and the similar toned pants! It’s always refreshing to see a men experiment and have fun with with his clothing. It’s good that he had styled his hair to pull together this look. Very interesting. Men to look became more womanly. We learn to look after ourselves. It is good progress. Really like the twist that the pants give to this look! Beautifull face …. and like alway excellent photo!! I see a dissonant note, the colour of his shoes, it´s a mistake to combine black shoes with a camel coat; I guess he has been forced to take those giant black shoes because wearing a superfluous black handbag. Two phones and a great man clutch. so….this lad is doing a little gen-bending with his ladies coat, no? i mean it looks like right-over-left buttoning and a clutch. well done! using classic women’s pieces that are based on a men’s military look, the affect is subtle. Lovely and classic. And how do you get the best smiles out of your subjects so consistently? love this whole composition, if mad men was make in 2012, Don would dress like this! Fabulous coat; for the gentlemen or the ladies. Man enough to wears those pants!!! Except for the shirt sleeves which personally ALWAYS have to be a little longer than the coat and come out from it… a look I like really a lot! Amazing and Elegant! Loving the Pykima Trousers trends!!!! Wow, crazy pants! For some reason, this still works (for me at least). And does he have two phones, a yellow and a pink one? nice coat, a bit feminine though. I agree… not a big fan of the pants! Nice to see a man in a camel long coat for a change!